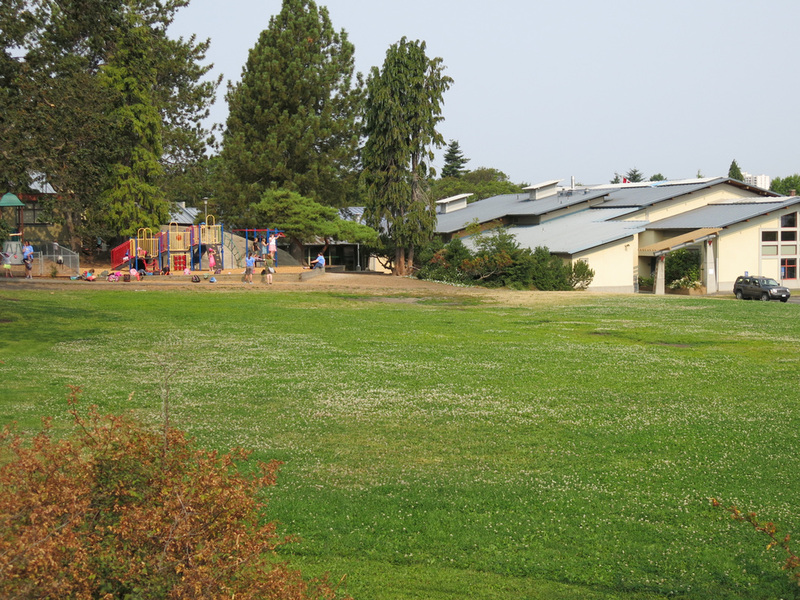 Celebrates five successful years in a new location: Robert J Porter Park. 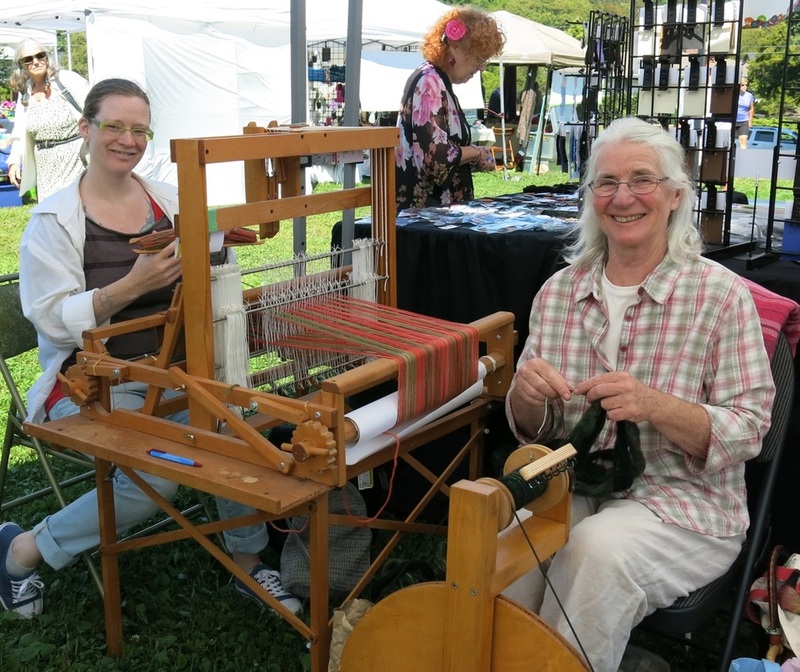 Scroll down to see photos of workshop guests and fibre artists at Fibrations on August 16. 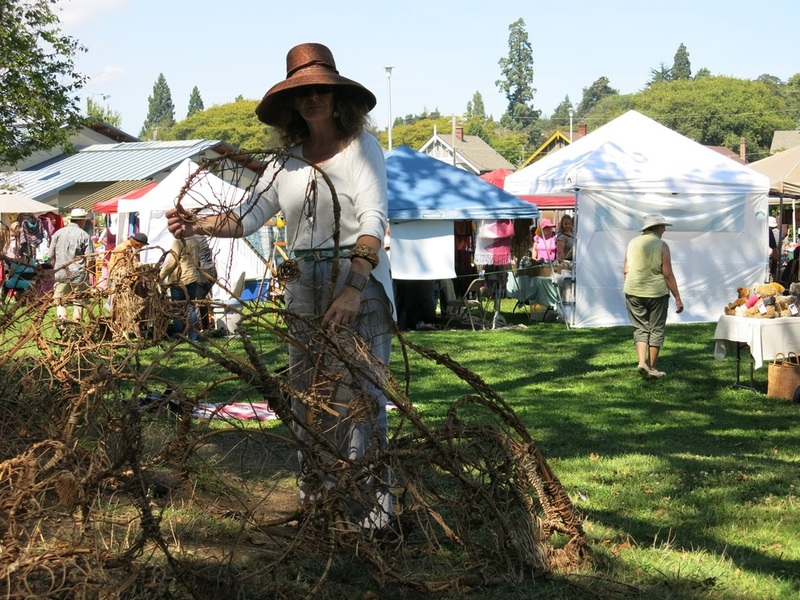 Fibrations 2015, is a festive gathering of fibre artists sharing their skills and original creations at an outdoor marketplace. This free, family-friendly event sports over 50 booths and several food vendors. The toonie raffle prizes are ever popular. On August 16, the event unfolds in Porter Park, a spacious green area behind Sir James Douglas School, 401 Moss Street. On August 15, workshops happen at the Garry Oak Room, 1335 Thurlow, and Knotty by Nature, 1704 Lillian Road. ​Fibrations is organized and sponsored by Knotty by Nature Fibre Arts. Other sponsors include Black Press, Thrifty Foods and all the vendors. Stephanie Papik and Ryan Davis founded Knotty by Nature in 2008. The entrepreneurial couple sell fibre supplies at 1704 Lillian Road in Fairfield. Their courses and workshops have introduced myriad folks to knitting, weaving, needle felting, wet felting and spinning. “We're excited about Fibrations expanding into Porter's Park," says Ryan. “There are activities for children, lectures and demos for adults, and lots of great shopping for all tastes." Above: Knotty by Nature brings kettle dyed sock yarn and felt-covered soaps to Fibrations. At left: Hand-dyed merino rovings and felted wool cords. Stephanie Papik & Ryan Davis at store. The Fairfield Gonzales Community Association hosts Fibrations at indoor and outdoor facilities. Vanya McDonell, Community Development Coordinator is pleased to partner with Knotty by Nature for this grass-roots festival. Connecting with new audiences like the fibre community is one of the association’s outreach goals. The Place supports local crafters and businesses, and hosts bi-monthly visual art shows in their expansive foyer area. 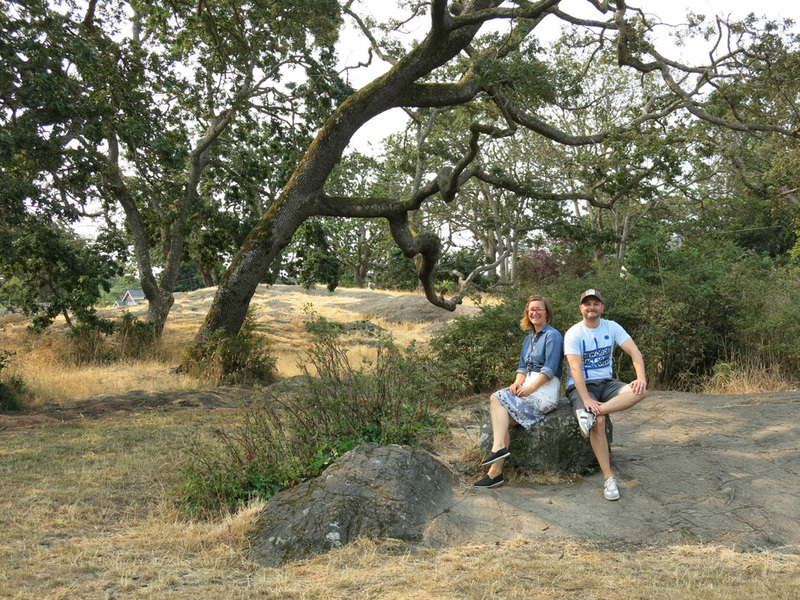 Thomas King, Recreation and Facility Coordinator and Vanya McDonell, Community Development Coordinator in Garry Oak meadow in Porter Park. 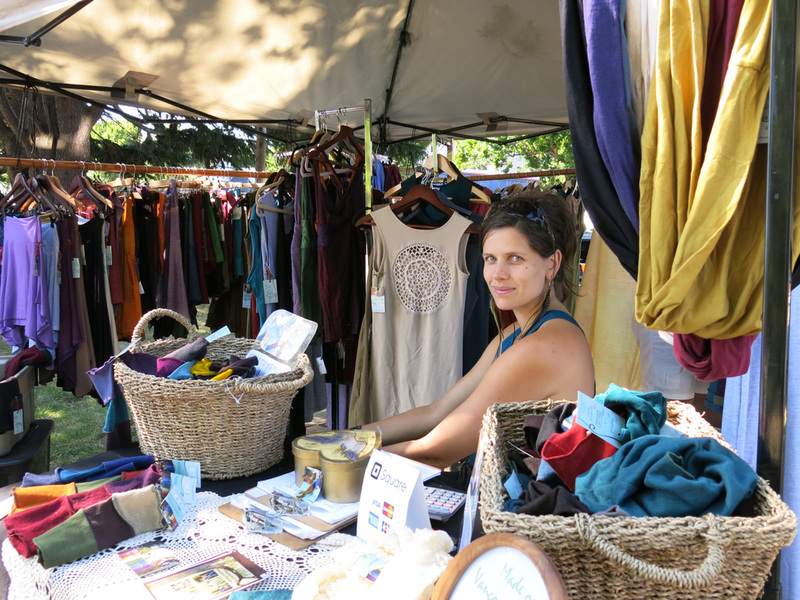 Porter Park home of Fibrations 2015.
makes one of a kind, hand-sewn graceful garments. The textile artist sells her clothing in several stores including Knotty by Nature. A regular at local fibre festivals, Ali looks forward to year three at Fibrations. “I love connecting with other fibre artists,” she says, “who appreciate the creative energy that goes into hand-made items.” The artist has many design ideas that evolve as she works with various fabrics, colours and textures. Her richly-hued materials and free-flowing styles endorse active living. With three children, a second business, and a farm with 50 animals, Ail embodies activity. “The only time I sit down is to sew, she says. Moonrise Creative founders (below, left to right) Metka Lazar. Pam Lewis, Stephanie Papik. 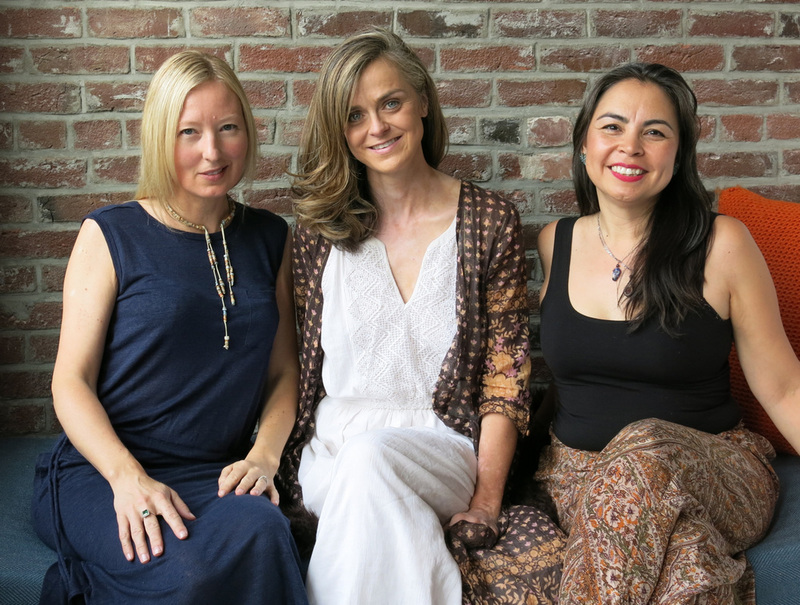 These three talented women organize workshops and events that nurture community and encourage creativity. Their workshops honour the spontaneous spirit and caring milieu of making and sharing. “Take what you need and give what you can” assures the circle way of peer support is cultivated in their stimulating classes. Japanese native Marie Suzaki, joins with the members of Moonrise Creative for two workshops. Saori or free-style weaving allows you to create a uniquely beautiful weaving in only three hours. Stephanie Papik demonstrates drop spindle weaving at the workshop. Saturday, Aug 15, 2015 from 10am-1pm or 2-5pm. Garry Oak Room, entrance on 1335 Thurlow St, adjacent Sir James Douglas Elementary. Drop spindles available at Knotty by Nature. Caitlin ffrench is a weaver and knitwear designer based in Vancouver. The artist conducts workshops, sells her wares on Etsy and Ravelry, and has over 3000 followers on Instagram. This year at Fibrations, her booth offers naturally dyed yarns, fabrics and knitting patterns. Caitlin lectures on Wildcrafting Natural Dyes at 2pm on Sunday. She studied textiles at the Kelowna Centre for Arts and Technology. Her husband is a tattoo artist, and they collaborate on art projects and installation events. This pattern was a collaboration with Lorna’s Laces and is inspired by Frida Kahlo’s painting "What The Water Gave Me". "Distinction" is a top-down triangle shawl meant to drape loosely - available as a free Ravelry download. Solar dyeing is a fascinating and sustainable practice using the sun as a heat source. Each participant learns about natural dyes and acquires two glass jars filled with yarn to steep on their window sill. “I live in Vancouver,” she says, “but it is still possible to find plants for dyeing purposes in alley ways, vacant lots and roadsides.” Recently, she gathered yellow-flowered Tansy from under the Sky Train tracks. 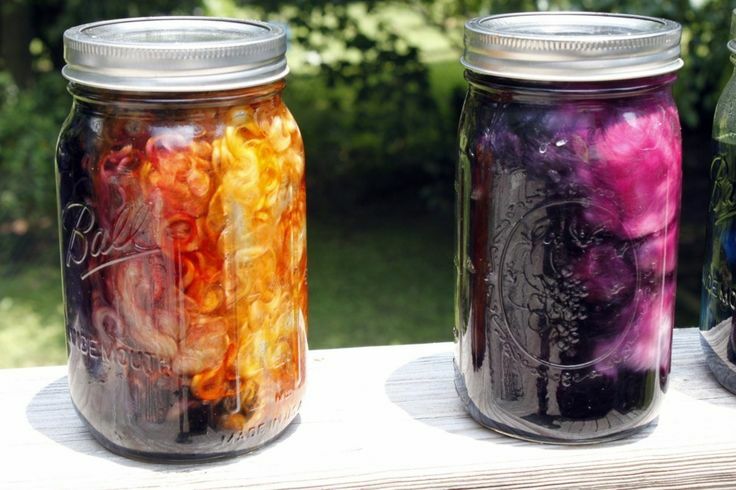 During summer, Caitlin makes stock solutions from plants and freezes them for winter dyeing. “I am always learning and experimenting with natural dyes and procedures,” she says. 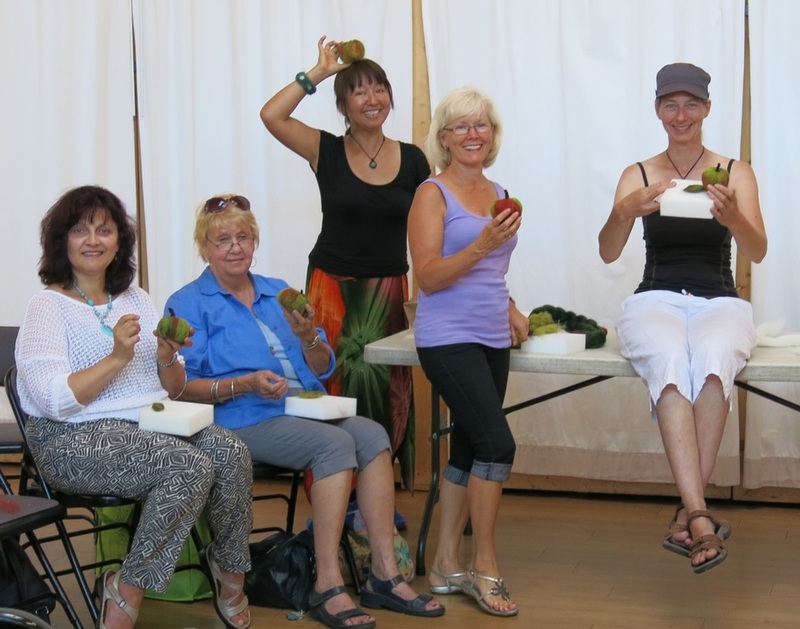 Below: photos of workshop guests and fibre artists at Fibrations 2015 on August 16. Fibrations festooned Porter Park with a canopy of colour, creativity and camaraderie on August 16. The change of location proved a great success, with easier access, more parking and inside facilities for workshops and demos. Of course the sun shone and everybody smiled, especially organizers Ryan Davis and Stephanie Papik (at left). The Saturday workshops on August 15 were a new addition this year. The Garry Oak Room hosted East meets West, Saori and the Circle Way. Two Solar Dyeing workshops enlivened Knotty by Nature. Caitlin ffrench (fourth from left) leads a workshop on Solar Dyeing. Carolyn Knight (under the hat) uses local and invasive species to weave unique designs. Here she works on free-form panels while chatting with visitors. Steve Ashton, owner and designer of Freedom Kilts, is passionately proud of all things Scottish. Making the long stockings worn with a kilt is easy if you have a sock knitting machine explains Steve. Marlene Luinstra (2nd from right) is facilitator of the Pathways Program at Garth Homer. She invites you to attend a free needle-felting class beginning Sept 9 at Fairfield Community Place, 10am. Claudia Lorenz (far right) instructs needle felting in the Garry Oak Room. Thanks to everyone who helped make Fibrations fantastic. See you next year!